An American car supplier from Tottenham. 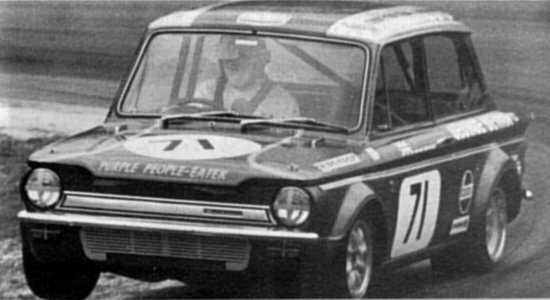 He bought the Imp in which Bill McGovern won the 1972 British Saloon Car Championship and used it in the 1973 season. I have noticed that in the competition section of your site you have made reference to Les Nash and have a picture of him, in the 'Purple People Eater', but no information whatsoever. Les Nash is my father and I am sure, if you are interested, he would be happy to help you with photos and info for your site. He was a very successful driver especially in the Imp and has a lot of interesting stories about this period of his racing career. They all started and all finished. 1 George Bevan (Drv. Bill McGovern) Sunbeam Imp 998 GB ? 75 G.J. Booth BLMC Mini 998 GB ? Silverstone is a long (almost three mile) circuit and has plenty of wide open spaces to enable the faster, and higher capacity cars to really blow off their small capacity competitiors. Ingliston is a circuit which you really have to drive, it being short and relatively twisty. 71 Commercial Credit & Discoutn Co.
Les Nash (both entrant and driver), Hillman Imp, #6, 998 engine, Group Div. 1 - he did finish, but not in the top-six. There were mixed fortunes for Green Belt Motor Club drivers Les Nash and Robin Donovan recently. Nash notched up his fourth win in only six starts in the historic touring car class. 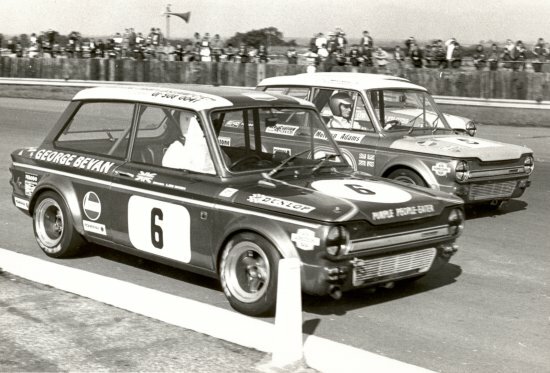 In his latest race at Lydden Hill, Kent, his Ford Lotus Cortina, named the Purple People Eater, started the 12-lap race in fourth place and quickly overtook the second and third placed cars. It then took him until the last lap to get on terms with leader Roger Cope's Jaguar. Unfortunately he failed by the tiny margin of 0.23 seconds to secure the victory. Les Nash - Still racing the "Purple People Eater" in Historic Touring Cars "pre 66". Mr. Nash was the outright winner (Ford Anglia 997cc) of the 1971 Hepolite Glacier Saloon Car championship.